Location: western section of Erèra – Brendòl plateau, at 1,686m asl, in the Municipality of Cesiomaggiore (Bl). Access: from Val Canzoi; possibility to park the car at the end of the valley bottom carriage road at the Hotel Boz. After La Stua artificial lake (710m) turn right and follow the trail marker CAI no. 802. The long mule-track climbing to Erera-Brendòl plateau, readjusted a few decades ago, corresponds for long stretches with the ancient route of the cattle migrating to summer pastures; some alternative routes give the possibility to shorten the main route. 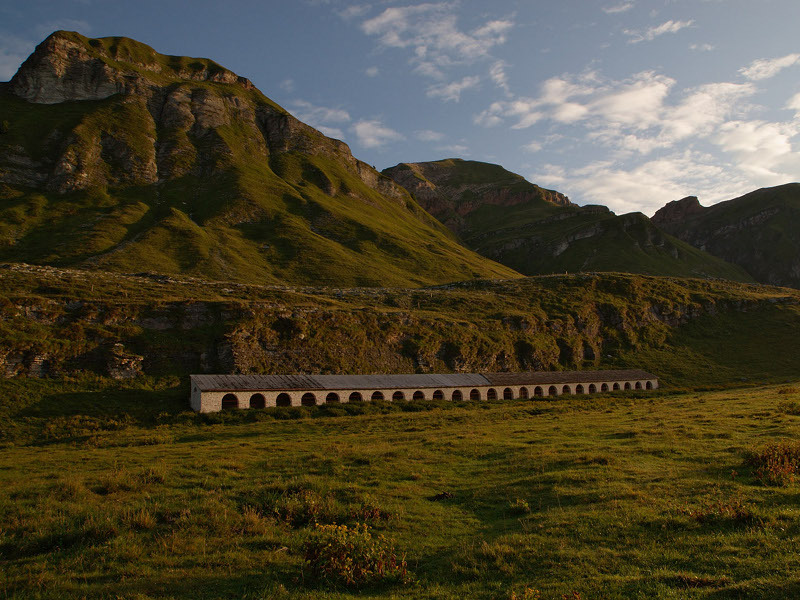 Environmental context – Description of the site: Erèra - Brendol plateau is a large and fascinating grassland, situated at 1,700m of altitude, that has always been used for the summer mountain grazing of the cattle. The plateau is characterized by the presence of two "malghe" which, not far one from the other, shared the large grazing land at disposal: malga Brendòl in the western section, and malga Erèra in the eastern section. Breeding was a very important source of income for the mountain people. Besides the wonderful landscape housing it, the importance of the breeding activity carried out in Erèra Brendòl plateau is highlighted by the buildings, in particular in the pendana di Brendòl, that is here an imposing structure made of stone with refined details, while usually is a simple and "poor" roof used to shelter the cattle. The great environmental-historical value recognized to the complex Malga Brendòl also depends on the natural environment, offering a landscape of particular beauty where the buildings have been wisely included. The malga is situated within the administrative borders of the Municipality of Cesiomaggiore and within the Park perimeter. Building period: unknown (the first known document on the "estates" dates back to 1466). Architectural features: rural complex of malga, intact in its original features. Great environmental-historical value. The complex of malga Brendol is situated on the northern edge of the large pasture and consists of a casèra and a pendàna. The materials used for the buildings are easily available materials: stone, lime (prepared on the spot) and wood (also used for the creation of mobile enclosures, the so-called "mandre", where the cattle was shut up in the evening). The casèra is a tapered building (27mx5m) developing in the north-south direction, and is formed by the addition of a series of premises functional to the activities carried out in the malga. The building is formed by a section organized on two floors, with stable-infirmary for the animals and two small rooms on the upper floor, and a one-story section consisting of a kitchen for the milk processing, a portico, and a storeroom for the milk (with two large openings closed with spaced wooden poles for the ventilation of the room). It is characterized by stone walls, wooden floors and roof; the mantle is in stone slabs (red ammonite) with interposed wooden laths used to level the covering and to prevent from the entrance of water from the roof. The pendàna (roof for the shelter of the animals) is a structure 91m long and 4m large, with a side leaning against a rocky spur and the southern side open towards the pasture. This side is characterized by 25 stone round arch openings, a particular and refined building solution, unusual in particular for a shelter for cattle, which gives pendana di Brendol a monumental aspect and unique features. The building could house about one hundred heads, watched over at night by the shepherds who used to sleep in elementary pallets situated on the roof beams. The walls are in stone and lime, the roof structure is in wood, while the mantle is in stone slabs. Also the floor is in stone, with pebbles near the opening, roadbed-litter where the cattle stood, dirt road for the backwater channel. Structures for the summer grazing, used as stables, accommodation for the shepherds, and for the conservation, transformation, and processing of the dairy products. Today abandoned (it was abandoned in the 1950s). The buildings, after the careful renovation measures carried out recently (philological renovation of the casera and the pedana with the recovery of a part of it which had collapsed), are in a good state of conservation. In the past, some parts of the pendana have been rebuilt. There are documents about a collapse that interested in the 1930s the western section of the building and then, in 1976 (a few days after the earthquake of Friuli) the whole eastern section of pendana collapsed. For years, only 11 out of the 25 arches survived. A recent measure carried out by Dolomiti Bellunesi National Park has enabled to recover the original aspect of the building.